Come support the I'll Fly Away Foundation Scholarship Program, enjoy great food in a fun atmosphere at Margaritaville Nashville, and be entertained by award winning and exciting talent! All for a great cause! The lineup includes: Grammy and Award Winning songwriters, Cordle Jackson and Salley, Sony Music Artist The Rhett Walker Band, International Bluegrass Music Association Momentum Band of the Year Monroeville, Atlanta GA favorites The Deadfields, Commedian Josh Phillips, and many more new up and coming acts! Arden, NC -- When Balsam Range member Tim Surrett was told by his niece, Paige, about two students at one school who are fighting cancer, he and his band mates heeded the call. A third grade teacher at Clyde Elementary School in Clyde, NC, Paige told Tim that the school was trying to find a way to help the two families, and the power of love and music was set in motion. A Sunday afternoon benefit was held at Haywood Community College with bluegrass artists Balsam Range providing the toe-tapping entertainment. All proceeds were donated to the families of young Carter Green and Howell Brown III. Carter was able to attend the event, but little Howell is currently hospitalized at Duke University. Nashville, TN -- As a recording artist, Wade Hayes enjoyed hit records including "Old Enough To Know Better" and "On a Good Night." He recorded 5 albums of his own and had a successful stint as a sideman as a member of longtime Alabama lead singer Randy Owen’s band. The charming Oklahoma native with the rich baritone was living his Country Music dream. Wilkesboro, NC -- MerleFest, presented by Lowe’s, has come to a close for another year. Early estimates show that, from its start on Thursday, April 25, to its close on Sunday, April 28, aggregate participation over the festival’s four days exceeded 76,000 participants, staying level with last year’s numbers. MerleFest, held on the campus of Wilkes Community College, has become the primary fundraiser for the WCC Endowment Corporation, funding scholarships, capital projects and other educational needs. Bristol, TN/VA -- It was during soundcheck on Saturday when virtuosic banjoist Bela Fleck and his lovely, and very pregant, wife Abigail Washburn learned their performance at The Paramount Center for the Arts that evening had helped raise more than $50,000 for educational programming at the Birthplace of Country Music® Museum. Madison, Virginia: Junior Sisk & Ramblers Choice will play at the Madison County High School on Friday, April 5, to benefit the Madison Rescue Squad. The show starts at 7 p.m. Admission is $15, and tickets can be purchased at Jones Auto Parts in Madison or contact Steve Grayson at 540-948-6914 or 540-820-7307. Owensboro, KY -- The International Bluegrass Music Museum is proud to announce the line-up for their epic 10th Anniversary of ROMP (River of Music Party). An international event, ROMP features legendary, traditional bluegrass artists alongside the far-flung roots and branches of bluegrass music. Rather than being a strictly bluegrass festival, it is a festival held strictly in support of the International Bluegrass Music Museum. Nashville, TN -- This week, the legendary Charlie Daniels hosted the Charlie Daniels’ Scholarship for Heroes event; a special free concert to support Lipscomb University’s Yellow Ribbon Enhancement Program. Daniels was joined by a chart-topping lineup of entertainment industry friends including Jason Aldean, Lee Greenwood, Chris Young and the multi-award winning Bluegrass music band, The Grascals, making their fourth consecutive appearance at the annual event. Nashville, TN -- 2005 CMA Entertainer of the Year and four-time Grammy Award winner Keith Urban and Country Music Hall of Fame member Vince Gill will return to Nashville's Bridgestone Arena on Tuesday, April 16, for a concert to benefit the Country Music Hall of Fame® and Museum. Reserved seating tickets, which are priced at $35 and $50 (does not include Ticketmaster surcharge), will go on sale March 1 at 10:00 a.m. CST. A limited number of VIP ticket packages will also go on sale on March 1 at Ticketmaster.com. The International Bluegrass Music Museum is proud to announce the line-up for the epic 10th Anniversary of ROMP. 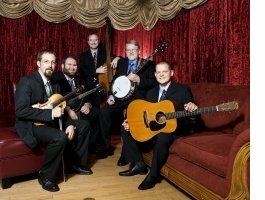 An international event, ROMP features legendary, traditional bluegrass alongside the far-flung roots and branches of bluegrass music. Rather than being a strictly bluegrass festival, it is a festival held strictly in support of the Bluegrass Museum.